The knives are being unsheathed in the Tory Party after Thursday’s electoral humiliation turns into a search for scapegoats. With the prime minister’s special advisors, Nick Timothy and Fiona Hill the first heads to role, Theresa May looks to be heading for the same fate. Former Tory Chancellor, George Osborne (not a fan of May’s by any stretch of the imagination of course) has called her a ‘dead women walking,’ in an interview with Andrew Marr on BBC TV today. If you want a good laugh visit The Telegraph, the house journal of the Tory Party, and read what they are saying. It is not at all complimentary. To further rub things in, Survation, the polling company who were closest to getting result on Thursday right, has published its first post election poll and it shows a 6 point Labour lead. 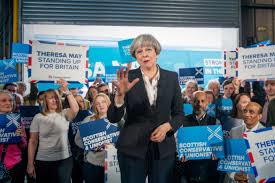 The comments on Conservative Home make it clear that May can’t carry on for much longer as prime minister, but the Tories are fearful of a new election being won by Labour, so they want to avoid one anytime soon. Although, if the above comment is anything to go by, some think the longer they leave it in calling another election, the bigger the defeat will be. A cheery thought, if they do hang on for a while. The only problem with removing May now, is that there is not a consensus on who should replace her. There doesn’t seem to be much appetite for a Boris Johnson premiership, but that is maybe who they will end up with. I think Corbyn will beat Johnson. My bet is, that May will announce within a week or two that she will be standing down, and the Tory Party will elect a successor. Then in the autumn or next spring we will have another general election. The odds now look like Labour will win it. It is 1974 all over again, but in the opposite direction. So are you suggesting that May will call a second GE and win it, like Wilson did?